As a busy mom, I’ve found that it’s the simple things in life that I enjoy the most. Fewer things are more relaxing than sitting down for a few minutes with my favorite essential oils. 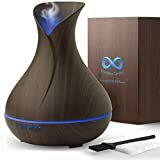 I have a few bigger rooms in my house, so I made sure to get the best essential oil diffuser for large rooms I could find so I can really immerse myself in my oils. There are several available, and I’m going to share a few reviews of my favorites as well as why you want one for your own home! Before we get to my reviews of the top six best essential oil diffusers, I’m going to outline a short buying guide. This will tell you everything you need to know about the best essential oil diffusers for large rooms. Each essential oil diffuser will usually have an approximate square footage they’ll cover. You can get your own room’s square footage by measuring the length and width and multiplying them together. Match it to your essential oil diffuser and get one that has a larger coverage area. Do you plan to sleep with your diffuser in your room? Maybe noises distract you. Either way, factor in the noise level. Larger diffusers have bigger motors. This leads to more noise when they run. Larger essential oil diffusers can run anywhere from six hours up to 18 hours. They usually come with a continuous run time and hour marks so you can choose how long you’d like it to go for. You want your essential oil diffuser to be safe when your kids or pets are around. Look for a diffuser with an automatic shut-off option, a stable build, and a secure reservoir. This will help it to stay upright and not fall over. One of the main benefits of having an essential oil diffuser for a large room is that they can typically run longer than smaller diffusers. This is great when I want to set them in my kid’s rooms to run for a few hours overnight. I can set it and know it’ll shut off when the allotted time is up. A second benefit is that you can use your essential oil diffuser in both larger and smaller rooms. You do have to be careful with your settings though because it can get strong if you run it for a few hours with a door shut and it’s a smaller room. You get the flexibility of using it in different size rooms without worrying about coverage issues. You want to start by finding a spot in your room that isn’t going to be in the way. If you have kids and pets like I do, this means putting it slightly out of the way by a wall on a sturdy table. Add your water and add a few drops of your essential oil. It will dissipate the longer your diffuser runs, so you do want to keep this in mind. You can set a timer and let it run, or you can let it run continuously for a few hours. You should notice the scent start out stronger and slowly taper off. The scent will spread throughout your room. If you don’t notice the scent as much, you can always add a few more drops of essential oil. Let it run, breathe it in, and feel it start to relax you. Just remember to clean it at least once a week to keep it running in top shape. 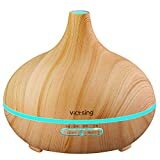 VicTsing’s essential oil diffuser comes with the capabilities of being both a diffuser and a humidifier. You get a large 300mL take that can run continuously for up to eight hours per fill. It has a waterless on and off function that’ll switch it off five seconds after it runs out of water. This helps to prevent the diffuser from burning out. You get three time setting modes that range from one to six hours as well as a misting mode with light and strong controls. This diffuser has seven LED color combinations that you can set to help get a relaxing atmosphere. It features a sleek and stylish wood grain look that fits into almost any decor. It has a full year warranty against damage or defects, and you get 45 days to return it if you don’t like it. 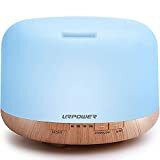 URPOWER’s essential oil diffuser comes with three different settings including an aromatherapy diffuser, humidifier, and a night light. When you have it set to diffuse, it vibrates 2.4 million times per second. This works to break your essential oils and water up into microscopic particles and fill the room. The large 500mL water reservoir is capable of running for up to 10 hours between fills. You can set it to switch off at 60 minutes, 120 minutes, or 180 minutes. If you just select on, it’ll run until it runs out of water or until you shut it off. As a failsafe, it’ll shut off automatically if it runs out of water to prevent burning out. It can change to seven different colors, and it has a sleek wood base with rounded corners for added stability. This essential oil diffuser by Everlasting Comfort comes with a very sleek and modern design. It has the capacity to hold up to 400mL of water, and this allows it to diffuse for up to 13 hours on a single fill. You’ll get four time settings that lets you set your diffuser to run for an hour, three hours, six hours, or continually. You’re also able to choose between a high output ratio of 50mL every hour or low at 30mL per hour. It automatically detects low water levels. When it senses them, it’ll shut your diffuser off automatically. This diffuser comes with a free cleaning kit included. It also has seven soothing LED colors that you can set for a continuous glow as long as the diffuser runs. This large essential oil diffuser features a tapered design with a large tank that can hold up to 2,000mL of water. You get a high and low output setting that allows you to quickly fill a big room with your favorite essential oil scent. The tapered tank also lights up with several different soft LED colors that you can set to stay solid or rotate through. You can also use it as a nightlight with the optional light only feature. This diffuser comes with a power adapter, customer support that is available seven days a week, a user manual, and a warranty that lasts a full five years. Additionally, the more slender design of this essential oil diffuser lets you place it almost anywhere without worrying about space constraints. You’ll get 12 to 18 hours of run time out of a single fill with this diffuser. It comes with a dark wood grain design and a round look that’s able to match a variety of decors. This diffuser has sensors built in that monitor the water levels and shut the diffuser off when it senses the water level is low. The diffuser emits a soft yellow light along the bottom when you have it running that helps to set a relaxing mood. You get a free essential oil bottle opener when you buy this device. Additionally, it comes backed by a satisfaction guarantee that allows you to exchange or return it if you’re not totally happy with it. There are two legs on the bottom of the diffuser for added stability. 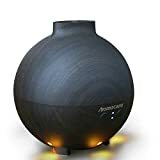 My pick for the best essential oil diffuser for large space is the VicTsing Ultrasonic Aroma Essential Oil Diffuser. I liked that you could double the use as a humidifier because my house tends to get dry in the winter months. The 300mL tank was also nice because it was big enough that I could run it all night while I slept. The wood grain design fits beautifully in with the rest of my decor, no matter where I put it in my house. Finally, I loved the soft LED lights. They really contributed to the relaxing atmosphere that I wanted to set.